Why do little girls beg their parents for a pony? Isn't that the standard stereotype for girls, that they always want a pony for their birthday? Of course, don't get us wrong, ponies are majestic, magnificent creatures, full of grace and power and with the beauty to rival the sunset, but how do little girls know that?! Maybe because little girls are just as magical as ponies and we just don't know it yet. Maybe they need each other, girls and ponies, so they can both be as magical as they're capable of. Honestly, we don't know what the deal is. We're just speculating here. But it is most certainly true that little girls and ponies go together like peanut butter and jelly! But not just ordinary ponies. No, that's old news. Little girls need ponies who are just as unique and rare as they are. Which brings us magical ponies! Like this Rainbow pony. You think most ponies are rainbow? Nope, sadly there are very few Rainbow ponies living in the wild today. They're too gorgeous looking for that. Instead, they live in secret, safe from the world. But are you going to let that stop you from giving your daughter the very best, most beautiful pony around? Of course not. In fact, you're going to make sure her pony is so spectacular, so magical, that no one can ever deny how special and incredible she is. 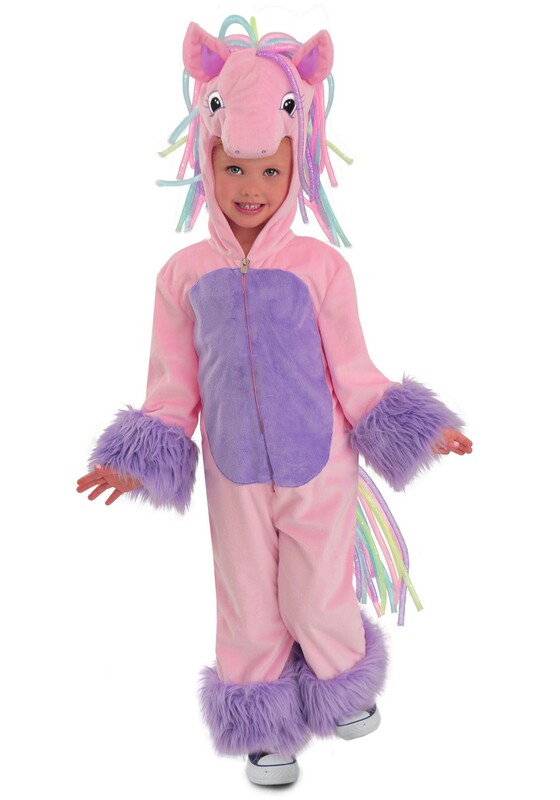 That's why this Rainbow pony costume is so perfect for her. With it, she can link to those ponies and experience life through their eyes, full of magic and wonder. Let her imagination (and spirit) run with the wild Rainbow ponies! In fact, you're going to make sure her pony is so spectacular, so magical, that no one can ever deny how special and incredible she is. That's why this Rainbow pony costume is so perfect for her. It's easy to transform with a zipper up the front of the soft purple and pink fabric. The hem of the sleeves and legs are lined with lush purple fur. With the colorful mane and tail she can link to those ponies and experience life through their eyes, full of magic and wonder. Let her imagination (and spirit) run with the wild Rainbow ponies!